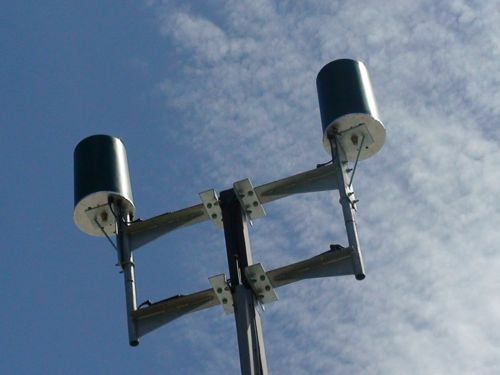 An example of a Distributed Antenna System (DAS) antenna atop a light pole. Credit: Sidecut Reports. In order to make sure that BCS doesn’t also stand for “Bad Cellular Service,” AT&T is beefing up wireless coverage inside the New Orleans Superdome in advance of the Jan. 9, 2012 national-title matchup between LSU and Alabama. According to Larry Lovell, a spokesperson for the Mercedes-Benz Superdome, AT&T is currently installing what is known as a DAS, or Distributed Antenna System, inside the cavernous arena. A DAS is basically a bunch of small antennas that connect to mobile phones the same way as big cellular towers do. Historically used inside office buildings and convention centers, DAS installs are now becoming a way for cellular providers to overcome the bandwidth challenges created by the onslaught of tens of thousands of fans arriving at stadiums with their smartphones ready to connect. The big numbers of customers wanting wireless access typically swamps the few cellular towers near stadiums, making connectivity a problem during game time. By placing a lot of small antennas inside the Superdome AT&T should be able to provide much better service to the expected packed house for the BCS title game. Using a DAS install to beef up stadium throughput is a tactic used by AT&T before, most notably at Cowboys Stadium for last year’s Super Bowl and most recently at Paul Brown Stadium in Cincinnati. Lovell said the AT&T DAS install at the Superdome is slated to be finished by Dec. 23 and activated by Dec. 26, in time for a test run at the Sugar Bowl game on Jan. 3, 2012, followed by the BCS Championship the following Monday. Though the Superdome already has an extensive Wi-Fi network, it is used for internal communications and services (like ticketing) and for media use, not for the general public. Lovell said the Superdome and AT&T are exploring the possibility of installing a public Wi-Fi network at a later date, along the lines of other AT&T projects at places like AT&T Park or Chase Field in Phoenix. Lovell said the Superdome and AT&T are currently negotiating with other cellular carriers to give their customers the ability to roam on AT&T’s DAS network. The Superdome install would be just the latest in a long string of aggressive DAS projects from AT&T, including a DAS network currently being installed in and around the Silicon Valley city of Palo Alto. If all goes well AT&T customers in particular should be able to send all those texts, LOLs and photos from the game without a hitch.